Home > Heavy Duty V Belts > V-Belts. A, B, and C Sections. Standard and Kelvar Construction > A-Section (Classcial) V-belts. 1/2" Wide > A101-KC Ultrapower V Belt. Kevlar Wrap A101 Industrial V-Belt. > A101 Classical V-Belt. 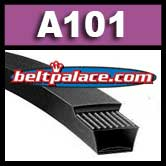 A101 Industrial V-Belt, Consumer Brand. 1/2” Wide x 103” Length OC (13mm W x 2616mm L OC). Features polyester cord reinforced, superior compression section for high temperature and load carrying performance. Static, Heat, and Oil resistant. High quality for low cost! NAPA, Grainger, Ametric (low grade) A101. OEM FITMENTS (Dimensional, not Construction): John Deere M110978, Stens 265-014, Cub Cadet: 754-04219, 954-04219, OCC-754-04219, MTD: 754-04219, 954-04219, Rover: 754-04219, Troy-Bilt: 754-04219, 954-04219.